Southern Lancaster County Historical Society, Inc.
OUR COVERAGE AREA - Solanco Historical Society serves the southern end of Lancaster County, Pennsylvania, including Quarryville Borough and Bart, Colerain, Drumore, East Drumore, Eden, Fulton, Little Britain, Providence and Sadsbury Townships. We welcome any information and inquiries pertaining to Southern Lancaster County. MISSION STATEMENT - This Society's purpose is clearly stated in our Mission Statement, which can be found under the above tab "About Us." CURRENT OFFICE AND RESEARCH HOURS - 9:00 A.M. to noon every Wednesday throughout the year. The office and archives are also open from September to May on the 2nd and 4th Saturdays of those months, also from 9:00 A.M. to noon. ROBERT FULTON BIRTHPLACE TOURS - For information on tours of the Robert Fulton Birthplace, see the detailed information under "About Us - Operating Hours." DIRECTIONS TO THE ROBERT FULTON BIRTHPLACE AND ARCHIVES BUILDING - Can be found under "About Us" above and the subheading "Find Us." MEMBERSHIP - Support the Solanco Historical Society by becoming a member. The Society welcomes anyone interested in learning more about the "Southern End" of Lancaster County and surrounding areas. See "About Us - Membership" for an application form and information on dues. FINANCIAL AND OTHER SUPPORT - Support of Solanco Historical Society can be accomplished by donating funds, historical objects, or your time. For complete information, click on the "About Us" tab above, then choose "Donations and Volunteering" and the subheading "Donate Funds", "Donate Goods" or "Volunteer Time." 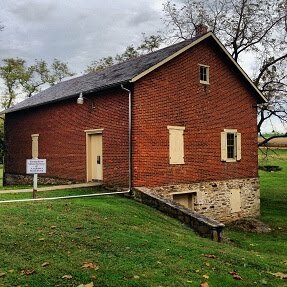 FREE MONTHLY PROGRAMS - Join us on the 3rd Saturday of each month, except December, at 1:30 P.M. when the Solanco Historical Society offers a free program by a researcher, teacher or collector at its headquarters meeting room. The Society's headquarters is located at 1932 Robert Fulton Highway (Rt. 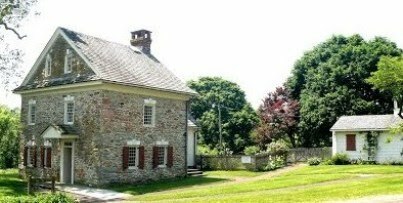 222) across from the Robert Fulton Birthplace near Swift Road, 6-1/2 miles south of Quarryville in Fulton Township. The programs are open to the public and the facility is handicapped-accessible. See the current listing under "Upcoming Events" above. Refreshments by a commercial provider will be available during the encampment. The Society's docents will be providing visitors with tours of the Robert Fulton Birthplace at $5.00 per adult and $3.00 per youth 6-18. Restrooms are available. Questions? Call 717-786-2528. 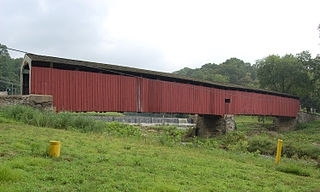 Below left: Pine Grove Covered Bridge, Little Britain Township. Below right: archives warehouse building, headquarters of Solanco Historical Society, located across from the Robert Fulton Birthplace on Robert Fulton Hwy./Route 222, Fulton Township.